About ten years ago a friend of mine, Munshi Ahmad Husain, who lived somewhere near Delhi paid a visit to Lucknow and rented an upper storey flat in the Chowk, Here a party of friends used to meet in the evenings and pass a few pleasant hours reciting and discussing poetry. The apartment next to Munshi Ahmad Husain’s was occupied by a courtesan whose ways were quite different from those of other women of her profession. She was never to be seen on her balcony nor was known to receive any visitors. The windows of her apartment were draped with heavy curtains and the door opening on the main street was always bolted - her servants used the back entrance. There was a window connecting this apartment to Munshi Ahmad Husain’s but this was also kept shut and secured by an iron bar twisted in the shape of a hoop. Sometimes at night we could hear the voice of a woman singing; that was the only indication that someone lived in the apartment. One evening, we were as usual reciting ghazals. I recited a couplet, and a soft voice in the neighbouring apartment exclaime.d “Wah, Wah!” This made us very curious. Munshi Sahib called out loudly: “It is no good applauding a poet in this manner; if you are fond of poetry why not honour us with your presence?” There was no answer, so we resumed our recitation. I had ne choice and accompanied the maid to the next apartment. It was a moonlit night in summer. Munshi Sahib had had the terrace sprinkled with water to make it cool. Carpets had been spread on the floor and covered with white sheets. Surahis fresh from the potters’, fragrant with a smell of earth and fresh water, were lined up on the parapet. The pan leaves had been delicately scented. The stems of hookahs had garlands of flowers twined round them and their smoke pervaded the atmosphere like heady incense. The only light besides that of the moon was a candle flickering in a glass shade, the shama which was placed in front of the poet whose turn it was to recite. Who will listen to the tale of my woeful heart? And I have much to impart. The lines incited Mirza Ruswa to ask Umrao Jan to ‘tell him her life story. Umrao Jan narrated it in a series of sittings which were subsequently committed to writing by the author and shown to Umrao Jan before being published. The most paying and interesting subject of study in this world is what happens to human beings; not only their external behaviour, but also their inner feelings and thoughts. These can be depicted through a novel provided an effort is made to present the picture truthfully .... We should not give ourselves unnecessary trouble by trying to base our novels upon the lives of persons about whom we cannot know anything in detail. In our own circle of friends and relatives there are bound to be many whose experiences are truly strange and fascinating. The trouble is that we do not pay heed to them because we cannot spare time from poring over the tomes of the histories of Alexander the Great, Mahmud of Ghazni, Henry VIII, Queen Anne, Napolean Bonaparte ete. The courtesan of Lucknow was no figment of Ruswa’s imagination. She practised her profession in Lucknow and Ruswa had much to do with her life and loves. Life of Mirza Mohammad Ruswa Accurate details of the life of Mirza Mohammad Ruswa are not available and there are material contra indications between the accounts given by his contemporaries. Ruswa himself mentions that his ancestors came from Persia and that his great-grandfather became an adjutant in thearmy of the Nawab of Oudh. The street in which the family home was situated is to this day known as Ajitun Ki Gali (Adjutant’s Lane). He has not much to say of his grandfather and father except that they were keenly interested in arithmetic and astronomy. Ruswa was born in 1857 (the year of the Mutiny) in the city of Luck- now where he also received his education. His parents died when he was sixteen and he became a ward of his maternal uncle, who relieved him of much of his inheritance. A man who befriended Ruswa was one Haider Bakhsh, a famous calligraphist of his day. he not only taught Ruswa the art of penmanship but also gave him money when he was in need. (Haider Bakhsh made a considerable fortune by counterfeiting revenue stamps. He was arrested and sentenced to a long term of imprisonment). Amongst many people who helped Ruswa in his writing career was the famous Urdu poet ‘Dabeer’. Ruswa studied at home and passed his matriculation and Munshi Fazil examinations. Thereafter he took an Overseers diploma from the Thomason Engineering School, Roorkee. For some time he was employed in the railway in laying tracks in Baluchistan. All through these years, he continued to write and study; his passions were chemistry, alchemy and astronomy. After a short term in Government service he resigned and returned to Lucknow, to teach and to write. He got a job as a teacher in the Local Mission School and then as a lecturer at the Christian College where he taught mathematics, science, philosophy and Persian. He left Lucknow for Hyderabad and worked in the Bureau of Translation of the Osmania University for a year. He returned to Osmania again in his seventies and died of typhoid fever on 21 October 1931. Ruswa’s first work was published in 1887 when he was thirty years old. This was a long poem recounting the romantic tale of Leila and Majnun. It was not well received. (His versification was amateurish, his wit unwitty, his satire stale and flat.) Portions of the work were condemned by critics as commonplace and vulgar. The criticism did not dampen Ruswa’s ardour to write poetry: he continued to compose mediocre verse to the end of his days. The first part of Afshai Raz was published when Ruswa was forty-five. No sequel is traceable. Three years later came Umrao Jan Ada. It was an immediate and thunderous success. Critics acclaimed it at once as the best narrative of the life and culture of Lucknow and praised Ruswa’s mastery of Urdu prose. Several editions of the novel were sold out. The theme no doubt contributed to its large sale, but it was its language that made it a steady seller for all time. Two other novels Zat-i-Shareef and Shareef Zada, did not do as well, but Akhtari Begum was again applauded by the Urdu-speaking intelligentsia. It is still considered by some to be the better of his two best works. Ruswa wrote a large number of tracts on religion and philosophical subjects. He had a deep and abiding interest in religion and Greek metaphysics. He was head of the Literary Department of the All-India Shia Conference and wrote twenty volumes on the Shia religion. Despite the name that Ruswa made for himself in literary circles, these novels and works of philosophy and religion did not bring him much money. His sustenance came from the worst kind of penny dreadfuls which had titles like The Loves of Satan, The Bleeding Lover; The Murderous Dame, etc. Ruswa was an excellent example of a dual literary personality - an earnest-minded Dr. Jekyll burning the midnight oil writing sublime prose, working out a system of Urdu shorthand or studying the movements of the stars - and the vulgarian Mr. Hyde, doing the rounds of the city’s brothels and churning up cheap trash to bring in filthy lucre. Ruswa’s eccentricities made him a legend in his lifetime. He could be so single-minded in his devotion to work as to forget the world about him. (There is a story of his having refused to go to the funeral of his own child because he was busy with some experiment.) When some- thing fascinated him, he could go on working twenty hours at a stretch for weeks on end - bathing in ice-cold water at midnight to keep him- self awake. He was vain and convinced of his genius. The ability for sustained work combined with a prodigious memory, helped him to learn, besides his mother tongue, Urdu. Persian, Arabic, Hebrew, English, Latin and Greek in a short time. Amongst his other interests were astronomy, higher mathematics, hydraulics, metallurgy and chemistry. He considered nothing beyond his ken. When the bicycle first appeared in Lucknow, he was sure that since it took other people some hours to learn to control the machine, it should not take him more than a few seconds. He rode without any assistance, had a nasty fall and fractured his collar-bone. Undaunted, he walked home, set the bone himself and proceeded with his work. The traditional boundaries between art and life began to collapse when the nineteenth century Urdu fiction gradually moved from the enchanting dastan-like cycles of medieval romance exemplified in Amir Hamza’s Tilism i Hoshruba, to the loosely connected episodes of Rattan Nath Sarshar’s (1846-1902) Fasana i Azad-earlier published serially in ‘Oudh Akhbar’ between 1878 and 1879-and finally to Mirza Muhammad Hadi Ruswa (1858-1931) who said in Umrao fan Ada, ‘I am simply recording a faithful portrayal of actual happenings and am not concerned with recording conclusions.’ Nazir Ahmed’s (1836-1912) Mirat ul Arus, Banatun Nash and Taubut un Nasuh, too, had come very close to the colloquial prose style but the load of instruction in these works subsumed their fictional narrative. Mirza Muhammad Hadi Ruswa did not want to write stories for instruction, or borrow tales from long-lost history, nor did he want to weave wild imaginary stories which required readers to totally suspend disbelief. 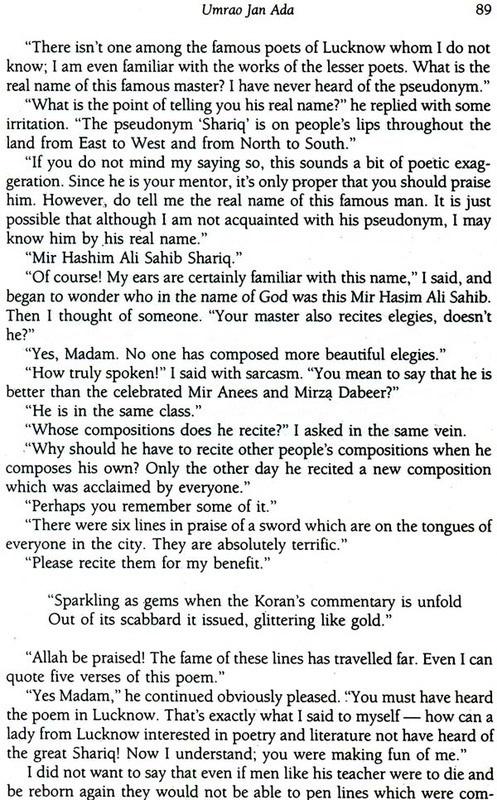 In the Preface to their English translation of Umrao fan Ada, Khushwant Singh and M.A. Husaini write of the Umrao Jan who appears first in Ruswa’s earlier, incomplete novel. Afshai Raz. Ruswa was obviously possessed not just by the story of Umrao Jan but also by her psychology and the inner working of her mind in relation to the external behaviour and the society in which she is situated. Ruswa uses self-conscious fictional devices to explore the inner scape of Umrao Jan’s personality; for he believed that the form of the novel was inherently suited to present human beings truthfully. But, as he said in the Introduction to his novel, Afshai Raz; ‘The trouble is that we do not pay heed to them because we cannot spare time horn poring over the tomes of the histories of Alexander the Great, Mahmud of Ghazni, Henri VIII, Queen Anne, Napolean Bonaparte etc.” Ruswa, in fact, can be acknowledged as one of the first theorists of the novel in Urdu. In Umrao Jan Ada he uses fictional, rather metafictional devices, to establish the truth of Umrao Jan’s life story. When he has had to work out complex narrative ways to ‘simply record a faithful portrayal of actual happenings’, he indirectly projects also the complexity of both Umrao Jan’s personality as well as her situation in a social context. Ruswa’s text is a narrative performance, gradually giving shape to Umrao Jan through a double narrative voice: Umrao’s first person narration, narrated by Ruswa who is himself an actor in the performance. The ‘Nazrien’ at the outset of the novel addresses the spectators (not readers), who are going to see the spectacle framed within the narrative voice of Ruswa, the author himself. In Umrao Jan Ada, Ruswa tells the story of Umrao as told to him, retaining the first person voice of Umrao. The first person narrative is frequently interrupted by comments made by the fictive listener who stretches the boundaries of the personal narration into the impersonal, critical and objective. In that the novel becomes as much the chronicler’s tale as the autobiography of Umrao. The text of the novel gives clear indications of the self-consciousness of the author in trying to construct this story as convincing and authentic. Ruswa gets Umrao’s story authenticated within the structure of his novel, dispelling the fictionality of the narration that may have built up in the reader’s mind. Such a conscious narrative strategy is defined, much later in the history of criticism, as metafictional. This brings to mind Patricia Waugh’s discussion on the theory and practice of self-conscious fiction in her book Metafiction. For her, the lowest common denominator of metafiction is to simultaneously create a fiction and make a statement about the creation of that fiction. Interestingly, this contemporary understanding of the novelistic techniques can well explain the making of one of the earliest novels as much as it can the highly sophisticated and deliberate experiments in the fiction of a century later. In metafiction, the illusion to present the real is dispelled. Ruswa’s extraordinary anxiety to assert the reality of his fiction stems from this very basic premise. He makes the reader get an endorsement of the reality of the story from a fictive character brought alive in his own name as Ruswa in the narration. Interestingly, the greater the desire to establish the facticity of the story within the narration, the greater the intensity of the tension between illusion and reality, fiction and truth. The resistance to the untruth gets embedded within the rubric of the story. And the metafictional thrust of the ‘you-may-not-believe-me’ approach posits itself against all conventions of realistic writing. The fictional aspect of the story is existentially present by virtue of the fact that it is after all a story within a text, a text constructed. This does not mean that the real world is abandoned; it is however manipulated and perhaps made that much different! The self-reflective stance of the narration makes the text more accessible to the reader. Some of the doubts, questions and points of debate which may occur in the reader’s mind, are raised by the author himself as a character in the novel. He is made out to be in the same position as the reader since he claims to receive the story from Umrao Jan and is merely retelling it. At times, the dialogues between Ruswa and Umrao within the novel may serve to temper Umrao’s mood; sometimes they may straighten some argument, or satisfy the curiosity of the reader in some way and sometimes they even help to connect some loose ends in the narration. Ruswa organises the story of Umrao Jan within the frame of his own distinct voice created as that of a character in the novel. Ruswa the author writes the tale of Ruswa the active listener reproducing the tale as told to him with occasional comments exchanged between the two of them within the novel. Though this device reinforces the illusion of reality, it also demonstrates the anxiety of the author to try and create an intimate semblance of reality. 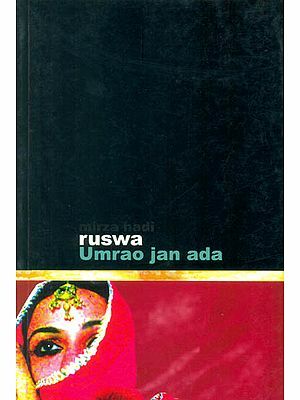 The narrative control of this novel rests on both Ruswa who is also the audience within the text and on Umrao the first person narrator of her own story, There is of course a deliberate maintenance of a perpetual consciousness that Ruswa’s subjectivity, however neutralised, lurks right behind Umrao’s ‘I’. In one instance when Umrao and Ruswa talk to each other, Ruswa takes the opportunity to speak in defence of virtuous women: ‘Let me say a few words in defence of other virtuous women who, like her and her daughter-in-law, spend their lives imprisoned within the four walls of their houses and suffer all the conveniences of a cloistered life ... When the men lose their money and youth, their mistresses cease to bother about them and they turn back to their wives who are their companions in distress. Why shouldn’t these good wives be proud, intolerant, harsh and unforgiving?” This is like a play within a play, an individual consciousness within another, male voice incorporated in the female narration, a social representative to comment on individual experience. All this is woven and achieved within the text of the story itself. The dynamics of the textual performance then significantly operate between and through both male and female points of view. Apart from an occasional flirtatious exchange between the two, Umrao and Ruswa are quite unsentimental and matter of fact with each other. Umrao’s story is the tale of a courtesan of poise and maturity recorded through a male consciousness. The male voice becomes convincingly androgynous in its presentation of a woman’s life. In fact, one influences the other and at the end of the novel Umrao admits that she shares a deep admiration and respect for purdah women which Ruswa had expressed earlier and wishes that their lot could have been hers (though she adds, with characteristic realism, that the suffocating atmosphere of purdah would now be unbearable to her). This is a sample of Ruswa’s feminist sensitivity, his remarkable capacity to own and tell the reality of Umrao’s life story with a clinical objectivity that can be contrasted with other contemporaries like Nazir Ahmed, Sharar and others in Urdu. Nazir Ahrned’s Mirat ul Arus, Banat un Nash, Taubat un Nasuh or Sharar’s Flora Florinda (the author called it a ‘naval’) remained distant from real happenings because they were all either too didactic, or replete with dastan-like tales.